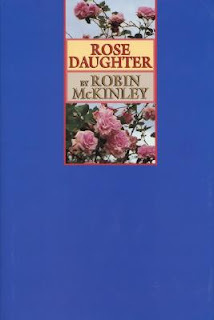 I talk about my love for Robin McKinley's books a lot, but interestingly I've only reviewed three of them on the blog. And only one of those was for a Retro Friday post. So when I cast around for the right one to highlight today, it occurred to me that Rose Daughter was the perfect choice. I know everyone's read Beauty . It was her first book. It's essentially a classic of fairy tale retellings now. And I love it and will always love it for giving me a Beauty who was not beautiful and avoided mirrors at all cost and a Beast with a library of books from all the ages, including ones that hadn't even been written yet. Makes my little heart sing just thinking of it and the way I absorbed it when I was twelve. 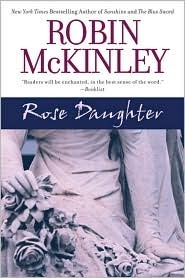 But fewer people are as familiar with Ms. McKinley's second retelling of the story of Beauty and the Beast. If you have a free moment, it's really worth hopping over to her site to read the wonderful essay, "The Story Behind Rose Daughter." It's lovely. When I discovered she was returning to her favorite fairy tale twenty years later and giving it a fresh new take in an entirely new novel, my skin tingled with anticipation. And not a little curiosity at just how she would give the story she'd done so well by a fresh take and whether or not it would capture my imagination the way the original did. People seem to be very divided on their loyalties to these two books. Some would fight to the death for Beauty and don't give Rose Daughter a second glance. Others feel quite the opposite and gravitate toward the slightly more lush second version. I've listened to these conversations. As for me, my heart is big enough to love them both. And I am so glad she wrote both books. Because someone who understands and loves that particular fairy tale the way it seems she does should never stop telling it, in my opinion. I would read a third and a fourth version and I will re-read these two for the rest of my life. Sigh. I love this book so much. It is, without a doubt, a more adult retelling of the fairy tale. And I don't mean that there is anything potentially objectionable in it at all. I merely mean that you can feel the depth of experience and emotion in the work, which I think represents what the author brings to the tale twenty years after she first retold it. The sisters feel a bit older, a bit more mature, though I always love that McKinley represents them as loving and kind to one another and as in the whole thing together. The Beast himself feels more ancient to me, closer to the end of his long existence, and we get even more background information on how he came to be the way he is and what his interminable penance has really been like. And the love of beauty and gardens and all living things permeates the page in such a way that I, who am the most unskilled and amateur of gardeners, go looking for a spade and seeds the minute I put the book down. The language in Rose Daughter swallows me up as well. I find myself eternally charmed by the archetypal names and the various village denizens the girls encounter: Miss Trueword, Mrs. Words-Without-End, Mrs. Bestcloth. Each personality is distinct and you can tell that they each have their own vital stories playing out, even as the focus remains on Beauty and her path. Each time I read it, I relish getting lost with her in the ever-changing castle that is the Beast's home, as the words and the corridors wrap their twisty novelty around me and the heady magic that suffuses the place and the world has its way with me. The romance is wonderful and just as it should be. The magic is dense and carefully woven. And the descriptions so visual I can call them to mind on any given day, so vibrant are the impressions they made on me. And the ending, you say? Well, you shall have to find out for yourself. To me, it is perfect. I'm interested what it is to you. 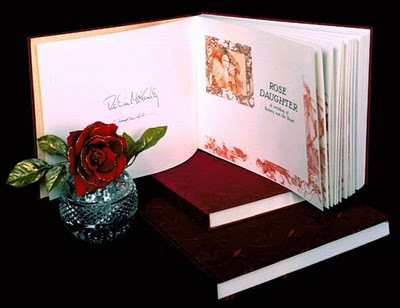 Lastly, I wrote a post a couple of years back on the exquisite edition of Rose Daughter my mother-in-law gave me for my birthday. It was a particularly fitting gift, as she loves gardens and roses, and I have learned to love them from her. The post is here, should you be interested in reading it, and here is an image of the book. It is an illustrated livre d'artist and, without a doubt, the most beautiful book I own. Lovely review! I, too, love both versions, 'though I gravitate to Rose Daughter. It is by far my favorite version of this fairy tale and a favorite re-read. I love her treatment of all the characters, and how the story unfolds. What a great review. I finally picked this one up a few months ago and have to say... it just didn't click with me. Perhaps it was due to my reading it during the 1st trimester (never a good idea) but I could never really fall into the story - it felt waaay too slow and I was turned off by all the gardening as opposed to you. I wish I felt differently, maybe I should just plan to return in a couple of years for another try. 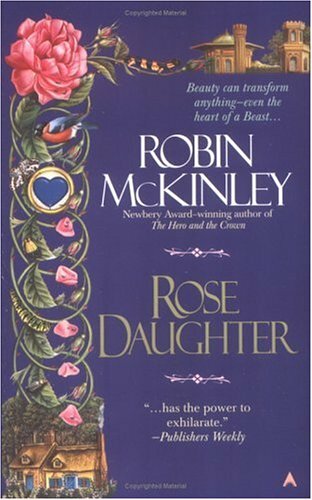 AH, I own that gorgeous edition of Rose Daughter too! Not signed by McKinley, sadly, but signed by the artist. Anyway, I agree with you on McKinley's two versions of Beauty and the Beast. I love them both. Great review and that book looks gorgeous. I read this a couple of years ago. I remember falling in love with Beauty and asking a friend to get this from the States for me because it wasn't available here. I can't remember the details in this one but I know that I loved Beauty more. Maybe I should do a reread to refresh my memory? I do remember that "Roses are for love." section that you quoted. Now I need to find my copy of Rose Daughter . . .
Maybe I would like this one more than Beauty? Hard too say. I think I should read The Blue Sword first. So jealous of that gorgeous gift from your mother-in-law!